Our clients often need to find the right solution for loading and unloading heavy machinery and equipment in and out of their vans. 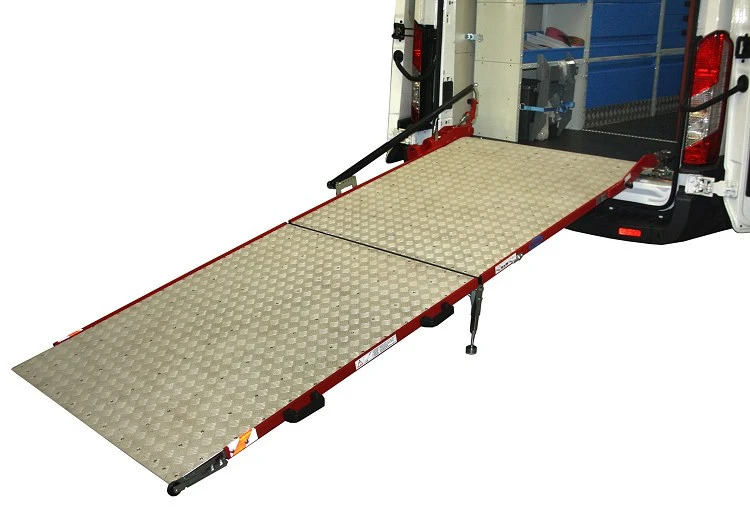 For loading equipment such as floor cleaning machines, small tractors, platforms, carts and other heavy materials, there is nothing better than having a loading ramp on your van. Our Syncro System line has a vast selection of loading platforms and ramps, in aluminum or steel and aluminum, in varying widths and lengths. Heavy duty ramps have a maximum weight capacity of 1,800 kg. The simplest ramps don't require installation and can be easily transported and set up where needed. 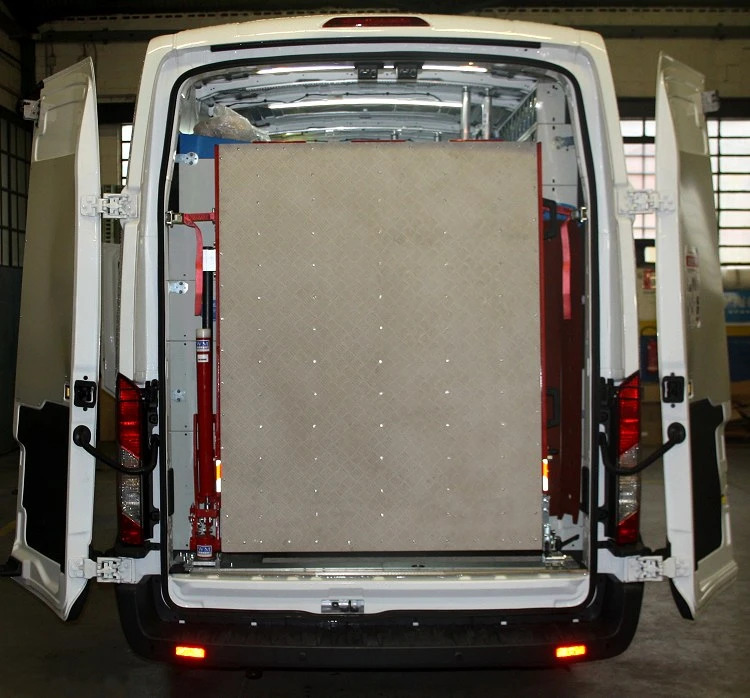 The ramps for heavier loading are mounted directly to the van ensuring extra safety. 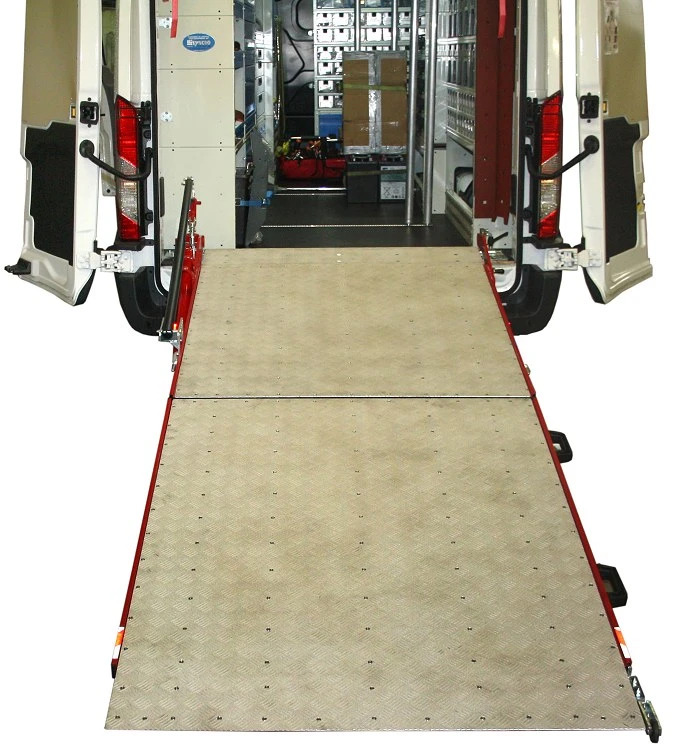 The ramp that can be seen on this page can hold up to 1,800 kg, and it is seen mounted on a Ford Transit L3 H2. 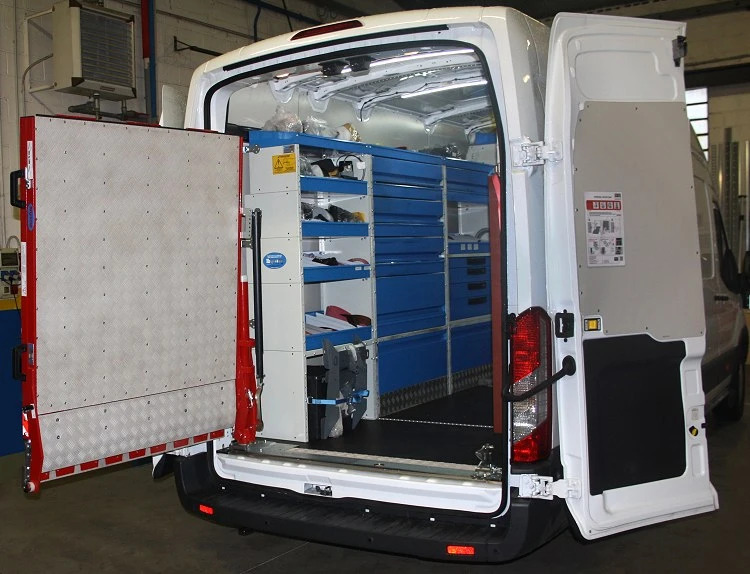 The upfit of this Transit includes the Syncro System resin-coated plywood floor panel and pre-coated galvanized steel wall paneling. The ramp, when not in use, remains folded up – taking up very little valuable cargo space. It can be easily opened and positioned in place, thanks to its built-in system of springs and shock absorbers. If you need access to the cargo area but you don't need the ramp, it can easily be swung out of the way, as if it were a third back door. The Syncro System ramp is fast, easy, safe, and can be opened into position without difficulty. It is TÜV certified and comes with a 3 year guarantee. Say goodbye to back-breaking loading and unloading of your van! Find other Ford Transit upfits, protective floor and wall panels, roof racks and ladder racks.